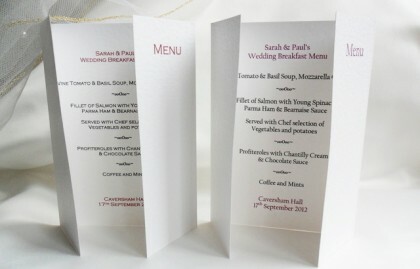 Gatefold Menu cards for all celebrations! Our well presented and beautifully printed gatefold menu cards are one of the best ways to make an impression on your guests and tempt them during your wonderful celebration meal or wedding breakfast. Gatefold menu cards are an attractive design and are easy to stand up on the table, you can guarantee they will look fantastic on your tables! We can print the header and footer details in a contrasting colour to match your colour scheme and we have a huge range of font styles to match to other stationery items you may have ordered. Our gatefold menus are produced using a thick heavy weight hammered textured card and are available in either white or ivory. We can also supply matching place cards, table numbers and table plan cards for your special meal.